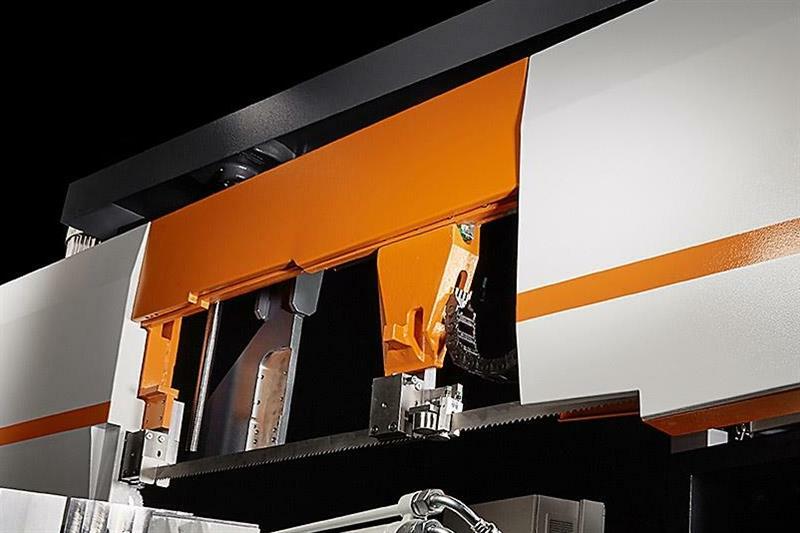 ​German sawing machine manufacturer KASTO is supplementing its bandsaw programme with the addition of a twin-column machine for cutting stock to length and mitring between -45 and +60° to a high degree of precision, the KASTOmiwin saw. Said to be ideal for use by steel stockholders, due to its power and rigidity, it is available in semi-automatic and automatic versions, U 4.6 and A 4.6 respectively, the latter having a rack-and-pinion drive to feed material by up to 3,000 mm in a single stroke. Blade downfeed is electrically actuated via a ballscrew drive. Clamping range of the new bandsaw is up to 460 mm, depending on material profile. The smallest size that can be cut is 10 by 10 mm. For single straight cuts, the KASTOmiwin semi-automatic machine leaves a rest piece of 30 mm, increasing to 200 mm on the automatic model. The user can adjust the band speed steplessly between 12 and 150 m/min. Installation length required by the KASTOmiwin is 3,950 or 5,450 mm for the version with material infeed. Positioning the saw head at an angle reduces the width to 2,980 mm, ideal for transportation in a container.